Biography*: Margaret Douglas, Countess of Douglas known as the Fair Maid of Galloway (died c. 1474) was a Scottish noblewoman, a member of the Black Douglas family towards the end of the family's position as a major force in Scotland. She was the daughter of Archibald Douglas, 5th Earl of Douglas and Eupheme Graham, daughter of Patrick Graham, Earl of Strathearn and Euphemia Stewart, Countess of Strathearn. She acquired Galloway when her two brothers (one of who was William Douglas, 6th Earl of Douglas) were murdered at the Black Dinner in Edinburgh Castle. She married her cousin William Douglas, 8th Earl of Douglas. When he was assassinated she obtained permission to marry his brother, James Douglas, 9th Earl of Douglas, but it is not entirely clear that the marriage ever happened, if it did it must have ended in divorce since they both married again. She then married John Stewart, 1st Earl of Atholl. She had no children by the Earls of Douglas, but two daughters by the Earl of Atholl. These were Janet, wife of Alexander Gordon, 3rd Earl of Huntly and Elizabeth, wife of Andrew Gray, 2nd Lord Gray. They both had issue by their respective husbands. She is a significant character in Black Douglas by Nigel Tranter, which is rather speculative about her relationship with the 8th and 9th Earls of Douglas. Biography*: Archibald Douglas (1390 – 26 June 1439) was a Scottish nobleman and General during the Hundred Years' War. Between 1423 and 1425 he married Eupheme Graham (before 1413–1468), daughter of Patrick Graham, de jure uxoris Earl of Strathearn, and Euphemia Stewart, Countess of Strathearn. They had three children. [S746] Wikipedia, online http://Wikipedia.com, http://en.wikipedia.org/wiki/Archibald_Douglas,_5th_Earl_of_Douglas. Biography*: Archibald Douglas, Duke of Touraine, Earl of Douglas, and Wigtown, Lord of Annandale, Galloway 13th Lord of Douglas, (1372–1424) was a Scottish nobleman and warlord. The eldest legitimate son of Archibald Douglas, 3rd Earl of Douglas and Joanna de Moravia of Bothwell, he was born either at Threave Castle or at Bothwell Castle c.1372 and was known as the Master of Douglas until his accession. By 1390 he had married the Princess Margaret of Carrick, a daughter of King Robert III of Scotland. Around this time, his father bestowed upon him the regalities of the Ettrick Forest, Lauderdale and Romannobridge, Peeblesshire. On 4 June 1400, King Robert appointed him Keeper of Edinburgh Castle for life, on a pension of 200 merks a year. At Candlemas 1400 George I, Earl of March and Henry 'Hotspur' Percy had entered Scotland and laid waste as far as Papple in East Lothian. The villages of Traprain, Markle and Hailes were burnt and two unsuccessful attempts were made to invest Hailes Castle. The Master of Douglas, who held the office of Lord Warden of the Marches, surprised them by night at their camp near East Linton and defeated the English Force. The Douglases chased the enemy away as far as Berwick upon Tweed, slaughtering many stragglers in the woods near Cockburnspath. Later that summer Douglas was second in command to David Stewart, Duke of Rothesay, the lieutenant of the Kingdom, during the siege of Edinburgh Castle by Henry IV. Henry was unsuccessful in his endeavours and with Owain Glynd?r's rebellion gathering apace in Wales, he became the last English monarch to ever invade Scotland in person. Archibald, the 3rd Earl died at Christmas 1400, and the new 4th Earl became the largest and most powerful magnate in the realm. His father's vast lordships stretched from Galloway Douglasdale, Moray, Clydesdale to the shires of Stirling and Selkirk. These were augmented by the forfeited lands of the Earl of Dunbar in Lothian and the Merse. In 1402 Douglas' brother-in-law, the heir to the throne, David Stewart, Duke of Rothesay was held in close arrest, first at the Bishop's Palace at St Andrews, then at the Royal Palace of Falkland. At Falkland, Duke David died on 27 March, in what have been alleged to be mysterious circumstances. The Duke was 24 years old and in good health prior to his arrest, and rumours abounded that he had been starved to death in Falkland's pit prison. Prince David had been arrested under a warrant issued in the name of his father the decrepit Robert III, by his uncle, Robert Stewart, Duke of Albany and Douglas. Both Albany and Douglas, were rumoured to have been the authors of any foul play suspected. This can be shewn by the fact that both men were summoned to appear before Parliament. However on 16 March, both men were acquitted when Parliament passed an act stating that the Prince had: "departed this life through Divine Providence, and not otherwise", clearing both of High Treason, and any other crime, and strictly forbidding any of the King's subjects to make the slightest imputation on their fame. This can be considered a whitewash, as the Kingdom of Scots could not afford to lose its two most powerful men due to renewed English hostility. Douglas and Albany were considered to be the only fit antidote to the traitorous Earl of March and his English allies. On 22 June the same year, a small Scots force was beaten by George Dunbar, the Earl of March's son, at the Battle of Nesbit Moor. Douglas led a punitive raid with Murdoch of Fife, Albany's son, as far as Newcastle to avenge the battle. At the head of 10,000 men he laid waste to the whole of Northumberland. March persuaded Henry Percy, 1st Earl of Northumberland, and his son Harry "Hotspur" Percy to lie in wait for the returning Scots at Wooler. Once Douglas' men had made camp at Millfield, relatively low ground, the English army rushed to attack. The Scots did however have keen sentries and the army was able to retreat to the higher ground of Homildon hill, and organised into traditional Schiltron formations. Douglas had not learnt the lessons that had defeated his great uncle at the Battle of Halidon Hill seventy years previously. The Schiltrons presented a large target for the English Longbowmen, and the formations started to break. A hundred men, under Sir John Swinton of the Swintons of that Ilk, chose to charge the enemy saying: "Better to die in the mellay than be shot down like deer". All perished. It has been suggested that Douglas hesitated to signal the advance of his main force, and when he did, it was too little too late. Douglas' mauled army met the as yet unbloodied English men at arms, and were routed. Many of Douglas' leading captains were captured, including his kinsman George Douglas, 1st Earl of Angus, Thomas Dunbar, 5th Earl of Moray and Murdoch of Fife. Douglas himself was captured having been wounded five times, including the loss of an eye. This wounding was despite the fact that it is alleged Douglas' armour had taken three years in its construction. If the Percies and the other English knights thought they had gained great immediate riches from ransoms, they were to be disappointed. They received a message from King Henry congratulating them their victory but forbidding the release of any of their prisoners. By 1403, Hotspur was in open rebellion against his King, joining with his kinsman Thomas Percy, Earl of Worcester and Owain Glynd?r, Prince of Wales. Hotspur set free his Scots captives and Douglas with his co-prisoners decided to fight alongside their former captors. In the chivalric spirit of the time, Douglas marched with his former enemy Hotspur, and his forces to the meet with King Henry IV at the Battle of Shrewsbury. Fighting on the English king's side was George de Dunbar, 10th Earl of March, then in exile from Scotland. The result of the battle was another rout, Hotspur being killed by an arrow through the mouth. Douglas was once again captured, and suffered the loss of a testicle after having fought gallantly on the field and personally killing Edmund Stafford, 5th Earl of Stafford and Sir Walter Blount. Douglas had again tasted heavy defeat. Douglas was now a captive of King Henry. The cost of ransom of the Scots nobles taken at Homildon was proving hard for the impoverished Scots exchequer. When Prince James of Scotland was captured en route to France by English pirates in 1406, the position seemed impossible. The aged King Robert III died of grief it is said soon after. The Kingdom of Scots was now in the hands of the Duke of Albany de jure as well as de facto. After giving his oath on Holy Scripture to King Henry to be his man above all others excepting King James, and on the production of suitable hostages for his Parole, Douglas was allowed to return to his estates to carry out his private affairs. Douglas had agreed again under oath to return to captivity in England upon an appointed day. At Easter Douglas went north and did not return upon the aforesaid day. King Henry wrote to Regent Albany complaining of this "un-knightly" behaviour and warned that unless Douglas returned the hostages would be dealt with at his pleasure. Douglas did not return. Only upon payment of 700 Merks in 1413 to the new King of England, Henry V were the hostages liberated. In a political volte-face, the Earl of March had been accepted back into the political fold in Scotland. Both Douglas and Albany being reconciled to him. In 1409 March's lands in Lothian and the Merse were returned to him. This on condition of the Regent that his Lordship of Annandale be transferred to the Earl of Douglas. With his Lordship of Galloway, Douglas now controlled the whole of South west Scotland. The friendship between Albany and Douglas was confirmed in 1410 when they arranged the marriage of John Stewart, Earl of Buchan, Albany's oldest son with Elizabeth, daughter of Douglas. Douglas went to Flanders and France in 1412, on arriving in Paris he entered into negotiations with John the Fearless, Duke of Burgundy whereby they agreed a mutual defence and offence pact in their respective countries. Douglas had resumed his duties as Lord Warden of the Marches soon after his return to Scotland. On the Border he had a free rein to defend it and to keep the peace. However, it appears that Albany was not prepared to pay for this, so Douglas recovered his costs from customs fees on all trade goods entering the country. In 1416, with King James still a hostage in England, Douglas twice visited London to enter negotiations for his release. Whilst there the Lollard faction, during Henry V's absence in France, tried to persuade the Scots delegation to go on the offensive. Albany decided that this would be an opportunity to reclaim Berwick upon Tweed and raised an army to take it. He despatched Douglas to Roxburgh Castle which was also held by the English. When the Scots learnt of a huge army led by King Henry's brother, John of Lancaster, 1st Duke of Bedford and Thomas Beaufort, Duke of Exeter, they retreated ignominiously. The following devastation in Teviotdale and Liddesdale, and the burning of the towns of Selkirk, Jedburgh and Hawick earned this title of the "Foul Raid". Douglas's son the Earl of Wigtoun had been fighting in France with his son-in-law Buchan, where they were able to inflict a heavy defeat over the English at the Battle of Baugé in 1421. In 1423 Wigtoun and Buchan, arrived back in Scotland to raise more troops for the War effort, and personal request to the Earl of Douglas from Charles VII of France to lend his aid. Douglas' ally and King Charles' implacable enemy, John the Fearless of Burgundy had died in 1419, so Douglas willingly consented to the French King. After considerable gifts to the church, Douglas left his son, the Earl of Wigtoun in Scotland. Wigtoun was charged with care of his estates and the negotiations for the release of King James, Douglas prepared for war. Douglas and Buchan sailed into La Rochelle with an estimated 6500 men on 7 March 1424. On 24 April Charles VII reviewed his new troops at Bourges. Douglas was given the post of "Lieutenant-General in the waging of war through all the Kingdom of France". On 29 April, Douglas was granted the Duchy of Touraine, including the "Castle, town and city" of Tours, and the "Castle and town" of Loches. Douglas was the first foreigner and also the first non-royal to be granted Ducal status in France. The newly created French duke was defeated and slain at Verneuil on 17 August 1424, along with his second son, James, and son-in-law John Stewart, 2nd Earl of Buchan. Douglas was buried in the choir of Tours Cathedral, alongside Sir James Douglas, his son. Archibald Douglas, 5th Earl of Douglas, and Wigton, &c., (1390–1439), who succeeded to the earldom. Elizabeth (d. c. 1451), who married first John Stewart, 2nd Earl of Buchan, secondly Thomas, son of Alexander Stewart, Earl of Mar, and thirdly William Sinclair, 3rd Earl of Orkney (d. 1480). [S746] Wikipedia, online http://Wikipedia.com, http://en.wikipedia.org/wiki/Archibald_Douglas,_4th_Earl_of_Douglas. 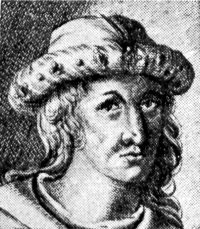 Biography*: Robert III (14 August 1337 – April 1406), born John Stewart, was King of Scots from 1390 to his death. He was known primarily as the Earl of Carrick before ascending the throne at age 53. He was the eldest son of Robert II and Elizabeth Mure and was legitimated with the marriage of his parents in 1347. In May 1390 parliament granted John permission to change his regnal name to Robert, probably in part to maintain the link back to Robert I but also to disassociate himself from King John Balliol. The four-month delay in the crowning of Robert III can be seen as a period when Fife and his affinity sought to ensure their future positions and which also saw Buchan's opportunistic attack on Elgin Cathedral, settling an old score with the Bishop of Moray and possibly also a protest at Fife's reappointment as the king's lieutenant. In 1392, Robert III strengthened the position of his son David, now earl of Carrick, when he endowed him with a large annuity that allowed the young prince to build up his household and affinity and then in 1393 regained his right to direct rule when the general council decided that Fife's lieutenancy should end and that Carrick now of age should assist his father. This independence of action was demonstrated in 1395–6 when he responded to Carrick's unauthorised marriage to Elizabeth Dunbar, daughter of George, Earl of March by ensuring its annulment. The king appears to have also taken over the conduct of foreign affairs, preserving the peace with Richard II and managing to increase the power of the Red Douglas Earl of Angus in the southeast of the country as a counterbalance to Fife's Black Douglas ally. He further showed his authority when in an attempt to reduce inter-clan feuding and lawlessness, he arranged and oversaw a gladiatorial limited combat between the clans of Kay and Quhele (Clan Chattan) in Perth on 28 April 1396. David of Carrick progressively acted independently of his father taking control of the Stewart lands in the south-west while maintaining his links with the Drummonds of his mother and all at a time when Fife's influence in central Scotland remained strong. David, Duke of Rothesay (b. 24 Oct 1378- d. 26 Mar 1402), who was betrothed to Elizabeth Dunbar but later married Marjory Douglas, the daughter of Archibald Douglas, 3rd Earl of Douglas and Jean Moray (or Joanna Moravia) of Strathearn. Margaret (died between 1450 and 1456), married Archibald Douglas, 4th Earl of Douglas, the son of Archibald Douglas, 3rd Earl of Douglas and Joanna de Moravia of Strathearn. Biography*: Annabella Drummond (c. 1350–1401) was the Queen Consort of Scotland as the wife of Robert III of Scotland. She was the daughter of Sir John Drummond, of Stobhall, near Perth, 11th Thane of Lennox and Chief of Clan Drummond, and Mary Montifex. Her father's sister was Margaret Drummond, the second wife of David II of Scotland. She married John Stewart (the future Robert III of Scotland) in 1367. Soon, she was enveloped in a power struggle with her husband's brother, Robert. Since Anabella and John did have two daughters, but no sons for several years, he was a supporter of a law that would bar women from inheriting the throne. Annabella was crowned with her husband at Scone Palace when he came to the throne in 1390. She continued bearing children until she was past forty and had her last child, the future James I of Scotland, in 1394. Robert, an invalid since 1384 due to an accident with a horse, grew increasingly despondent and incompetent throughout the 1390s. During this time he is said to have said to his wife that he should be buried in a dung heap with the epitaph "Here lies the worst of kings and the most miserable of men". Anabella was prompted to take matters into her own hands. Protecting the interests of her oldest son, David, she arranged a great tournament in 1398 in Edinburgh, where her oldest son was knighted. In April of that year she also called a council where he was created Duke of Rothesay and Lieutenant of the Realm in the same year. Shortly after his mother's death he would be imprisoned by his uncle and died in mysterious circumstances. The Fife burgh of Inverkeithing was a favorite residence of the queen. Her presence is still recalled in the sandstone font, decorated with angels and heraldry, which she presented to the parish church of the town, one of Scotland's finest surviving pieces of late medieval sculpture. Mary, married first to George Douglas, 1st Earl of Angus, second to Sir James Kennedy the Younger (by whom she had Gilbert Kennedy, 1st Lord Kennedy), third to William Graham of Kincardine, and fourth to Sir William Edmonstone of Duntreath. [S746] Wikipedia, online http://Wikipedia.com, http://en.wikipedia.org/wiki/Donnchadh,_Earl_of_Carrick. [S826] Betty Milligan, "Milligan to Nolan," e-mail to Shirley Frances MacFarlane, Oct 22 2014. Lochawe, and obtained the lands of Ardkinglass at the head of Loch Fyne. He m.
1 RMS 1424-1513. No. 346. 4 RMS 1424-1513. No. 1464. 5 RMS 1424-1513. No. 2354. © Gordon MacGregor: The Red Book of Scotland Project - 2017. Biography*: Alexander Montgomerie, 1st Lord Montgomerie (died 1470?) was a Scottish nobleman and diplomat.